Two-fifths of people (40%) say they burn their skin in the sun on purpose to ‘deepen’ a tan, according to new research by Macmillan Cancer Support1. This is despite the fact that getting a painful sunburn just once every two years can triple the risk of skin cancer (melanoma)2. The UK-wide poll surveyed 1,000 men and women and reveals that a quarter (25%) felt that burning in the sun was the only way they could get a tan – yet over 90% were aware that sunburn can cause skin cancer. People in the Midlands and Wales are 30% more likely than people in the North and Scotland to burn in the sun in order to tan3. The poll also showed that young people (aged 18-35) were found to be more than twice as likely as their parents (aged 55+) to believe that burning in the sun will result in getting a tan quicker. After the long, cold winter one in ten (10%) were planning to sunbathe in the UK without sun tan lotion – which could be putting their lives at risk. 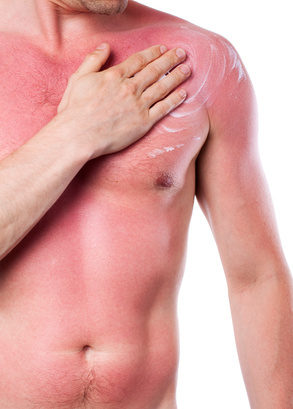 Men are almost twice as likely as women to not use any sun tan lotion. The number of people diagnosed with malignant melanoma, the most serious type of skin cancer, in the UK is on the rise with around 35 people being diagnosed every day4. Carol Goodman, Skin Cancer Nurse Specialist on the Macmillan Support Line, says: “This new research shows that despite being aware of the health risks people are still burning themselves in the sun in order to get a tan. As we start to look forward to summer after one of the coldest winters yet, it is alarming that staying safe in the sun is not a priority for many people. No one should face cancer alone. The Macmillan team is here to support you every step of the way. For more information or to donate visit www.macmillan.org.uk or call 0808 808 00 00. 1. Macmillan Cancer Support/Toluna Group Ltd (March-April 2013) A survey of an online panel of 1,000 men and women aged 18 plus, from across the UK, was conducted on behalf of Macmillan Cancer Support. Fieldwork was undertaken between 26th March – 27th March 2013. The figures have not been weighted. 2. Cancer Research UK. Preventing melanoma. 3. Macmillan Cancer Support/Toluna Group Ltd (March-April 2013). A survey of an online panel of 1,000 men and women aged 18 plus, from across the UK, was conducted on behalf of Macmillan Cancer Support. Of those surveyed, 60% in the Midlands and Wales burn in the sun in order to tan compared to 46% in the North and Scotland – 30% is the percentage change between these values. 4. For more information on the number, profile and experiences of people with malignant melanoma please see Macmillan’s Rich Picture on Malignant Melanoma, available here. For more information about Macmillan’s research and evaluation see our website.